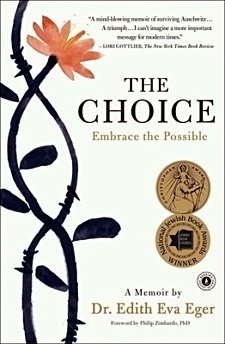 It’s 1944 and sixteen-year-old ballerina and gymnast Edith Eger is sent to Auschwitz. Separated from her parents on arrival, she endures unimaginable experiences, including being made to dance for the infamous Josef Mengele. When the camp is finally liberated, she is pulled from a pile of bodies, barely alive. The horrors of the Holocaust didn’t break Edith. In fact, they helped her learn to live again with a life-affirming strength and a truly remarkable resilience. The Choice is her unforgettable story. An eminent psychologist and one of the few remaining Holocaust survivors old enough to remember life in the camps, Dr. Edith Eger has worked with veterans, military personnel, and victims of physical and mental trauma. She lives in La Jolla. The Choice is her first book.